A while back I wrote about how you should prepare for a new expansion. The post covered the idea from a high level point of view. Today I will dive into some specifics. I will take a look at the potential for long term investments in Legion materials. Lately I’ve been going back and writing up guides on crafted transmog gear from Mists of Pandaria and Warlords of Draenor. These markets are still decent moneymakers and we would expect the Legion crafted markets to be similar once BfA rolls around. Legion materials will likely hit their lowest price point ever some time between now and the launch of BfA as players get rid of their stock to get ready for the new expansion. Based on this logic we will want to stock up on any materials that are used in transmog recipes as these are likely to retain value. Longer term I expect the prices of both the materials and the finished crafts to increase relative to the pre BfA level. This has happened with both WoD and MoP material markets before and I expect it will unfold again. What does this mean for tailoring? Now that we have the basic idea out of the way we can look at what this might mean for tailoring. In BfA the crafts that are most likely to hold value as transmog are all the various silkweave crafts. Tailoring has access to 2 sets, one rare and one epic. Both sets are likely to have some value as transmog. Together with the 4 different cloaks this means we will want to stock 24 different items. For a lowdown on the current market for imbued silkweave head to my post on the matter. It is still very relevant. There are three main materials you need to craft the various tailoring items: Shal’dorei Silk, Arkhana and Blood of Sargeras. As of right now Blood of Sargeras is Bind on Pickup. I think there’s a very good chance that they will be made tradeable before the end of Legion. Blizzard has done this before with Spirits of Harmony. They might not though so we need to be ready for every eventuality. How fast will the items sell? To figure out how many materials we should buy we will try to figure out how fast the crafted items will sell. 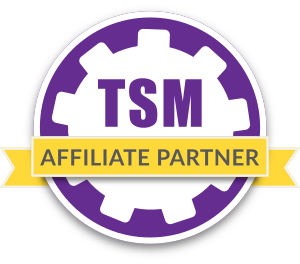 The easiest market to compare this to is the Warlords of Draenor Hexweave crafted gear market. Currently the items have average daily sales between 0.02 and 0.06 depending on the slot. This translates to an average of 1-1.5 sales per month per realm. Obviously this is likely to vary quite a bit between realms, but it works nicely as a baseline. How many materials will I need? I’m going to use rank 2 recipes as the main baseline for how many materials you use per craft. Rank 2s are generally profitable right now and I expect they will continue to be profitable. 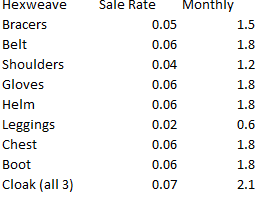 Using the sale rates I found for hexweave above and assuming I will stock all the silkweave and Imbued silkweave craft you will go through about 740 silk per month, 128 Arkhana and 19 Bloods of Sargeras. I also assume that these materials will never be cheaper. If you want to stock up enough materials that you are likely to be self sufficient throughout all of BfA You would buy out about two years of materials. If the Bloods of Sargeras are not made tradeable we will need less than this as then we will not bother with the crafts that require bloods. If you are planning to stock other tailoring crafts as well then you would likely want to buy more. Does it make sense to buy this much? The first thing we need to check is whether you can really store this much. 17762 is about 89 slots of materials. That can easily fit in one guild bank tab and should therefore not be too much of a problem. In terms of gold spent this will likely not be prohibitive either. At the current region market value price the silk would be about 78k gold. The arkhana would be 42k. In general this should be in reach for a lot of players. If it makes sense to buy this much or not is up to you, but I am certainly planning to go on a spending spree! 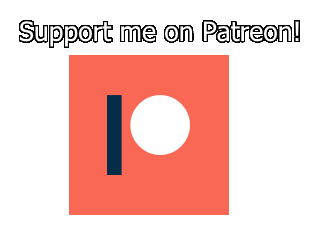 If you enjoy my content you should consider supporting my patreon because it will give you early access to all my posts! Well Dome, and congrats on another excellent piece! I have 2 questions though, 1 about this article, and 1 more general question about preparaat for BfA release. 1) What is your opinion about the Legion tailoring bags in BfA in terms of profitability? 2) I recently talked to someone who had enchanting as the 2nd profession on all of Jos characters. This has the obvious advantage of always being able to disenchant items, but you would lose out on a lot of gathering / crafting potential. My question here is simple, is this worth it or not? Thanks in advance for info! 1) No idea yet, I’m not in this market in Legion either. It depends on the relative crafting costs of a ton of other competing bags. 2) I honestly wouldnt do that unless you already have every profession covered. The benefit from disenchanting random stuff is very marginal compared to having access to a completely new profession. I’m not entirely sure what made him go with this, but what I do know is that even with enchanting on every character, all other professions are still covered. So every character, I’m not entirely sure how many, had enchanting / X, with X being different for each one. I don’t think enchanting is too good as a duplicate profession. The benefit while leveling is small and at max level the benefit relies on actually playing your characters to get stuff to disenchant. I prefer duplicating professions with valuable daily cooldowns. Alchemy is the one I have across many of my characters for pyrium transmutes. hmmm… One piece of particular gear a month does not look attractive unless prices will be sky high. But, if they sell for high price, there will be inevitable competition, hence sales will be less (like 1 per few months even) unless you will keep an eye on AH 24×7. That’s the average across all realms. High pop realms will sell more and lower pop less. As with all crafted transmog markets this will revolve around having a very large stockpile of various items. Obviously there are good arguments for not bothering with this, but crafted transmog usually has very large profit margins and fairly low competition.